Villanova setting up their offense. Photo by Jason Schott. 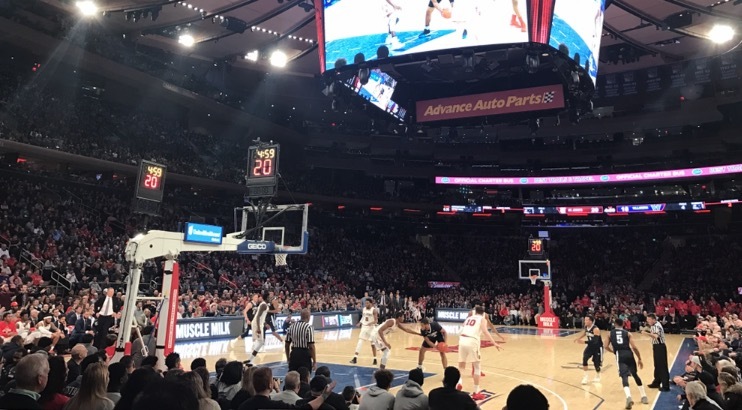 The Villanova Wildcats, the number-one ranked team in the country outlasted St. John's 78-71 on Saturday night in front of 17,123 at Madison Square Garden. Villanova has been the top-ranked team in the country for four weeks this season, and they improve to 16-1 overall, 4-1 in Big East play. For St. John's, the story is quite different, as they dropped to 0-6 in Big East play (10-8 overall) but played with a lot of pride tonight in their first game since Marcus LoVett was ruled out of the season on Wednesday. Villanova has now won 13 straight over St. John's, with the Red Storm's last win in the series coming in Philadelphia on February 26, 2011, Steve Lavin's first year as head coach of a team that made the NCAA Tournament. St. John's came out strong on defense in this one, as Villanova did not get their first point until the 16:51 mark of the first half, on a free throw by Omari Spellman. Their first basket came on a three from Eric Paschall at 15:46. St. John's led for most of the first half, powered by 10 points from Shamorie Ponds. The turning point in the half was a stretch of eight straight points from Donte DiVincenzo off the bench that keyed a 12-3 Villanova run giving them a 34-25 lead, and they would go into halftime with a 34-27 edge. Villanova began to take over in the second half, as Jalen Brunson drained a three to make it 43-33 at the 16:43 mark. They maintained that lead throughout, and a DiVincenzo three gave them an 11-point edge, 61-50, with seven minutes left. St. John's made a late run, as they went on a 7-0 run capped by Ponds free throws that made it 69-65 with 1:18 remaining. Villanova made seven free throws in the final minute, five of which came from Mikal Bridges, and it was a Bridges dunk with 15 seconds left that made it 77-69 and iced the victory. DiVincenzo led Villanova with 25 points off the bench on 7-11 shooting, and a superb 6-9 from behind the arc, with seven rebounds and three assists. Bridges had a double-double with 15 points (3-10 FG, 1-6 threes, 8-9 free throws) and 11 rebounds, three blocks, two assists, and the one blemish, five turnovers. Brunson had 12 points (4-10 FG, 2-4 threes), with five assists and five rebounds. Spellman had 10 points (4-7 FG, 1-2 threes), seven rebounds, and one assist. St. John's was led by Ponds, who had a career-high 37 points on 15-28 from the field, but was 0-6 from behind the arc. He had seven rebounds and two assists. Incredibly, Ponds was the only player to score in double figures for the Red Storm, as Justin Simon and Bashir Ahmed had just seven points apiece. St. John's shot just 43 percent of the field, or 28-64. When you take out Ponds (15-28), they were 13-36. They were 1-12 on threes, with the only one coming from Bryan Trimble, Jr. in the first half, and he finished with five points. Villanova was held to a very similar 43.4 percent from the field, or 23-53, well below their 96.2 points per game and 5.7 percent shooting percentage, which leads the Big East.